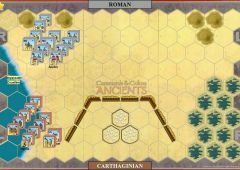 Following the Battle of Agrigentum, the Carthaginian leaders deceided to avoid pitched battles and instead fall back on fortified posts, while harassing the Romans with their fleet and guerrilla raids. The focus of the war shifted to Rome’s succesful struggle to wrest naval supremacy from Carthage, 260-265 BC. 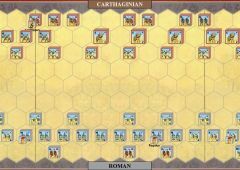 With the seas clearof the Punic navy, the consul Gaius Attilius Regulus landed in Africa with a small army of 15,000 infantry and 500 cavalry in 256. In the emergency, Carthage called out her seldom used civic levies under two generals, Hasdrubal Hanno and Bostar. These generals assembled about 10,000 militia foot, along with about 1,500 cavlary and some elephants. The council also recalled Hamilcar from Sicily with 5,500 crack mercenaries. 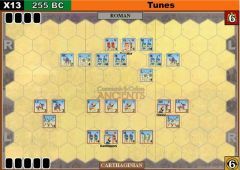 The Punic army advanced to meet the Romans ata Adys. The Carthaginians, hesitant to face the legions on the plain, encamped in rough,hilly terrain. Boldly, Regulus launched a dawn assault on the Punic camp from two sides. The Puni! 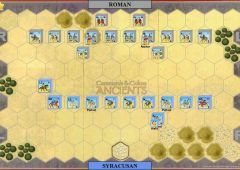 c cavalry and elephants were unable to engage effectively, but Hamilcar led his mercenaries in a vigorous counter-attack. The mercenaries drove back one legion, but were then caught in the flank and cut down in a fierce struggle. 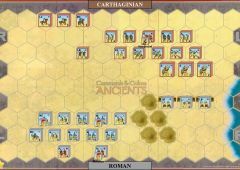 The Romans then routed the Punic militia and overran their camp. 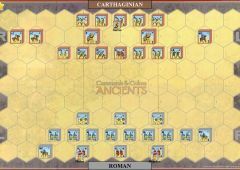 Carthage sued for peace. Regulus offered terms that were impossibly harsh, prompting Carhage to renew the struggle. A Spartan mercenary captain, Xanthipus, was hired and Cartage fought on. A Roman unit that captures (occupies) a camp hex counts as a victory banner for the Roman player. As long as the Roman unit remains on the camp hex, it conttnues to count toward the Roman viciory. If the unit moves off or is eliminated, it no longer counts. 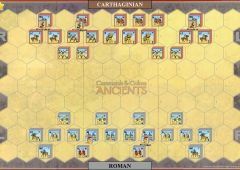 (*) The Carthaginian player starts with 2 Command cards. On turn 1 play one card, draw 2 cards. Carthaginian player now holds 3 Command cards. On turn 2 play 1 card, draw 2 cards. Carthaginian player now holds 4 Command Cards . On turn 3 play 1 card, draw 1 card. 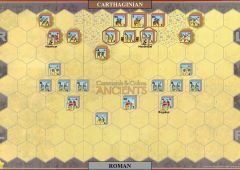 Carthaginian player hand size stays at 4 Command Cards for the rest of the battle. 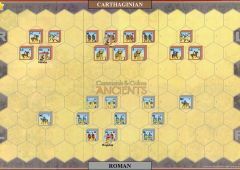 Played this twice, the Romans rolled over the Carthaginians both times. Hard to see how the Carth win here without some crazy luck.